Almah was intended to be a solo endeavour for Angra front man Edu Falaschi. However, recent problems in which Angra parted ways with their management, only to then be informed that their former management owns the right to the Angra name has stalled the band in its tracks and has resulted in Almah being Edu's main focus now. Their debut album featured appearances by guitarist Emppu Vuorinen (Nightwish), bassist Lauri Porra (Stratovarius), drummer Casey Grillo (Kamelot) and guitarist Mike Stone (Queensrÿche). Re-tooling the band with permanent new members including fellow Angra band-mate Felipe Andreoli (bass), Edu has produced a much better and more focused album this time around. Fragile Equality is based on a story that was co-written by Edu and deals with maintaining balance in all aspects of life. The result is an album that is much better than Angra's last effort Aurora Consurgens as far as I'm concerned and has similarities to Rebirth era material yet explores other aspects of power metal that fall outside the realm of the typical Angra sound. From the opening few bars of Birds Of Prey, it's obvious that Edu Falaschi is not trying to avoid Angra-like material. On the contrary, he seems intent on trying to carry on the tradition. Birds of Prey as well as Beyond Tomorrow and Meaningless World all carry the flag of Angra very proudly with speedy tempos, soaring and spirited vocal melodies and an epic sound that is highlighted by harmony guitar work and very crafty lead solos. The choruses to many of the tracks really do fall into the Angra realm yet Magic Flame ventures more into classic Edguy territory with its huge, epic style. You'll Understand is a very intense, keyboard flavored track with heavy riffs and an excellent instrumental lead break. The Brazilian folk edge of the Angra sound makes an appearance on Invisible Cage, a track that uses a traditional feel with acoustic guitars yet morphs into a heavy riff driven song that bursts with melody and a huge melodic Angra style chorus. 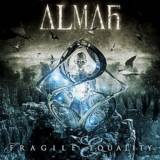 Almah isn't afraid to take on a more aggressive metal approach with the title track Fragile Equality and Torn. Both tracks are much more harder-edged with thrash metal style riffs and heaviness yet neither track compromises on melody whatsoever. A couple of power ballads namely All I Am and Shade Of My Soul really showcase the power and strength of Edu's voice and add a nice change of pace within the flow of the album. Guitarists Marcelo Barbosa and Paulo Schroeber do an amazing job on this album with a perfect blend of riffs, lead fills, harmonies and solos. Nothing is overdone or out of place in any of the songs on this album. This is an excellent album and one that I've been listening to for a few weeks now. With just enough similarities to the Rebirth era of Angra, Fragile Equality should fill the void left by the potentially lengthy absence of Angra from the power metal scene as they battle in the courts to retain the rights to the use of the name. Edu Falaschi has a very solid new band here and with a great sound and excellent song writing, they should be a very powerful force on the power metal scene. Combining all that's great about power metal with soaring melodies, huge choruses, exciting riffs/leads and enough variety to make for a very enjoyable listen, you really can't go wrong with this album especially for Angra fans.